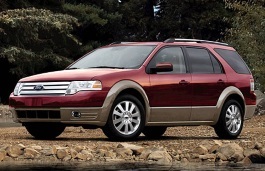 Correct Wheel Sizes, PCD, Offset, Rims and Tire specs for Ford Taurus X series. Nothing is clear on any of these sites.. I've been searching for a wheel and tire combo since April of this year and because of all these mixed signal/numbers, I haven't a clue on who can be trusted with the correct information. My advice.. Take the measurements yourself and report back here or create your own site with your data. I'm sure it would help others. NP.. We're in the same boat though I have a feeling we're getting closer to finding a set of wheels for our 015 Ford Transit Connect. Matter of fact the reason I spotted your post is because the bolt pattern & center bore on the Taurus wheels are the same. (16x6.5, 5-108, 5x4.25, 63.4) and might fit our microCargo van. But I'm leaning towards the Ford Focus ST 17x7 wheels. GL with your search. The PCD for the 2008 Taurus x is wrong it is114.3mm think the rim number will also be wrong! Hi Al, thanks for the information, we have updated data.